History affects us all. The echoes of decisions made centuries ago continue to shape our lives in ways both large and small. A case in point would be the current attempt by the Canadian Armed Forces to procure a new service pistol. As unlikely at it seems the past and future of this acquisition is connected with U.S involvement in the Spanish-American War of 1898. At the end of that conflict the United States found itself in possession of the former Spanish colony of the Philippines. This fact was the cause of much rejoicing by the forces for Philippine independence, as represented by the First Philippine Republic, until it became obvious that the force of some11, 000 U.S. ground troops sent to the Philippines intended to stay. The resulting Philippine–American War lasted from February 4, 1899 to July 2, 1902. At the same time US forces were engaged with the Moro Rebellion (1899–1913), a conflict between Moro indigenous Muslim ethnic groups and the United States military which took place in the southern Philippines. It was in the fighting against the Moro tribesman that the U.S. Army became dissatisfied with the .38cal side arms they were then equipped with. Legend had it that the guerillas they faced shrugged off the effects of the small caliber weapons. This perceived lack of lethality lead to the purchase, in 1902, of 4,600 Colt Model 1878 revolvers to equip the Philippine Constabulary. These revolvers had a 6-inch barrel, a hard rubber grip, and were chambered for the .45 Colt round. By coincidence this same weapon, the Colt Model 1878 Revolver was Canada's official military-issue handgun at the beginning of the Twentieth Century. 1001 of these pistols had been hastily purchased in early 1885 to arm the military forces mobilized to deal with the North West Rebellion. 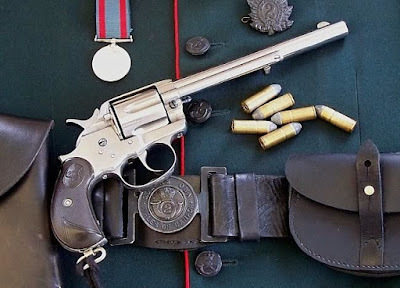 No other pistol having been acquired by the Department of Militia and Defence since that date, this double-action revolver model, with a 7.5" barrel and chambered for the .45 Colt cartridge was issued to appropriate members of the First Contingent of the Canadian Special Service Force dispatched to South Africa in late 1899 for service during the Second Anglo-Boer War (1899-1902). With the outbreak of the First World War Canada's military once more found that they lacked modern weapons. Pistols acquired for the First Contingent of the Canadian Expeditionary Force were again obtained from Colt: this time, the handgun adopted was that company's "state-of-the-art" Model 1911 semi-automatic pistol. A total of 5000 self-loading ("semi-automatic") pistols with a 5.03 in (127 mm) barrel and chambered for .45ACP cartridge with a detachable magazine with 7-round capacity were acquired, all coming from Colt's 1914 "Commercial" production . This Colt Model 1911 had become the standard U.S. Army side arm largely because of the experiences of the Philippine conflict. Looking for a more powerful and modern weapon they adopted the Colt M1911. It served as the standard-issue sidearm for the United States Armed Forces from 1911 to 1986. The Inglis made Browning Hi-Power a semi-automatic pistol chambered for 9mm Parabellum with a 118mm barrel and detachable 13-round magazine has been in service in Canada from 1944 to the present. Designed just before the outbreak of World War II by FN in Belgium, the factory that made the Hi-Power was used after the Germans occupied the country in 1940 to provide a variant of these hand guns to Hitler’s forces. In Canada John Inglis and Company, with a little help from Dieudonné Saive, the Belgian firearms engineer who helped design the gun in the first place, started manufacturing the weapon in Toronto. These guns at first were meant to be shipped to China but in the end most of them never made it to the Asian theater of that global conflict and were instead used to arm British and Canadian troops. Even after Inglis ended their production of the Hi-Power in 1945 Canada was left with enough that they have been using them ever since. In the United States the M1911 was replaced by the 9mm Beretta M9 pistol as the standard U.S. sidearm in October 1986, but due to its popularity among users, it has not been completely phased out. Modernized derivative variants of the M1911 are still in use by some units of the U.S. Army Special Forces, the U.S. Navy and U.S. Marine Corps. The competition to replace the Colt 1911 in US service was bruising; highlighting the importance the military puts on what is a very minor weapons system. It may not be necessary to invoke the shades of Freud in a discussion of why this is so, but it is true none the less that the selection of a personal sidearm tends to gather to itself an enormous amount of attention. The Americans wanted a new pistol which used 9mm NATO caliber ammunition. Rather than simply ordering new Colt 1911’s in 9mm they started a procurement exercise in which they discovered, to their horror, that no American company could meet the specifications they desired. Several attempts to recast the competition to find an American pistol that could meet those specifications only resulted in the, unwelcome in some quarters, conclusion that the Beretta M9 was the best choice. The U.S Army first began the attempt to replace the M9 and procure a new pistol or “Modular Handgun System” in 2008 and work with the small arms industry started in early 2013. After a process almost as protracted as the original competition to acquire the Beretta M9 the U.S. Army announced on January 19th of this year that they had awarded Sig Sauer a contract worth $580 million to make the next service pistol based on the company's P320 handgun. In Canada the Canadian Armed Forces have announced that sometime early next year a nation-wide survey of the military will be conducted about the future of pistols and “to define the general concept of employment” and a replacement program stood up to retire the Inglis made Browning Hi-Power and replace it with a new gun. There is no question that these weapons need replacing. Although the guns have been refurbished over the years and a smaller number of SIG P225 pistols were acquired in 1991 for use by military police and Royal Canadian Navy boarding teams, operations in Afghanistan have only accelerated the rate of non-serviceable pistols. The wear and tear on the Brownings has reduced available weapons to 13,981 and of those 1,243 are in the process of being disassembled for spare parts, in order to keep the other guns going until a replacement can be found. Last year army procurement officers briefed industry representatives about their quest for a new pistol. Industry officials were told that between 15,000 and 25,000 handguns are needed and the military estimated the project would cost around $50 million, according to documents recently obtained by the Ottawa Citizen. Sometime in 2019 or 2020 the requirements for a new gun will be defined and then by 2022 the military will seek approval from the federal government to proceed with a purchase of a new general service pistol or GSP. If the purchase is approved – and there are no delays – all the new pistols will be in hand and being used by 2026. The Citizen also reported that industry representatives have privately questioned why Canada would take so long to buy a new pistol, noting that the process could be completed in about a year or two at most. It should also be noted that the Browning Hi-Power is one of the most widely used military pistols and is still in production and in service in many countries. There is a clear way ahead for this procurement program. Using the example of the government’s recent purchase of F-18 Super Hornets a suitable number of firearms should be purchased as an “interim” measure to deal with the newly discovered capability gap. One no doubt caused by a previous Conservative government’s mismanagement of the Small Arms Modernization project. At the same time it is vital that a competition for all aspects of the Small Arms Modernization project should be held, later in the government’s mandate. To re-enforce interim nature of the weapons to be purchased they should be designated as a Provisional interim substitute transitional ordnance-limited service (P.I.S.T.O.L.S.) in all future discussions. A quick browse of the internet suggests that Browning makes a comparable weapon which sells in Canada for about $1,200.00 which means that 15,000 of them would cost taxpayers $18,000,000.00. 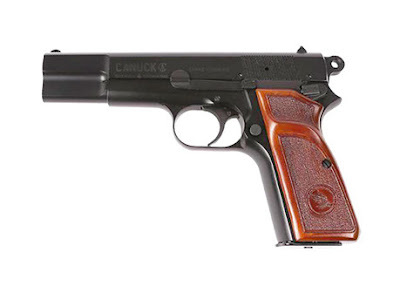 An even better deal can be found for a Canadian made weapon, the O’Dell Engineering Canuck Hi-Power, a Canadian made clone of the Browning weapon. With their connection to Colt Canada and with a cost of about $700.00 per unit they could probably make 15,000 of them for about $10,500,000.00 and that would include a spare magazine and that cool maple leaf on the grip. Either of these choices would also leave a great deal of money in the budget for the more important business of having a proper procurement competition to find a permanent replacement for the Inglis made weapons. As well as achieving the goal of delivering the right equipment to the CAF in a timely manner this procurement must also leverage the purchases to create jobs and economic growth in Canada and at the same time be seen to be streamlining the defence procurement process. As has been pointed out this would entail briefing industry officials and getting feedback, defining requirements, getting government approval and then moving ahead with the acquisition. Needless to say these steps will only be the beginning of the process. All this must be run through the Defence Procurement Secretariat (DPS) which in turn reports to a Deputy Ministers Governance Committee (DMGC), chaired by Public Services and Procurement Canada (PSPC), which consists of deputy ministers from DND, Innovation, Science and Economic Development (ISED), Global Affairs Canada, and Fisheries and Oceans Canada (which is responsible for the Canadian Coast Guard) who act as the key decision-making body for defence procurement. The DMGC then provides guidance on defence procurement to a Working Group of Ministers, chaired by the Minister of Public Service and Procurement, which includes the ministers of National Defence, Innovation, Science and Economic Development, Foreign Affairs, International Trade and Fisheries, Oceans and the Canadian Coast Guard. It is the function of the Working Group of Ministers to ensure shared accountability in defence procurement as well acting as the forum for discussion, advice and to resolve issues in the implementation of major procurement projects. The Armed Forces will have to provide a Statement of Requirements (SOR) to start the process. This will be the opportunity to exhaustively explore issues such as the need for a Picatinny style rail, suitability for suppressor attachment and magazine capacity. This in turn leads to a discussion of caliber, and surely no discussion of handgun caliber could be complete without a mention of the Sirius Dog Sled Patrol and the need to fend off polar bears. This will undoubtedly raise the question in some quarters as to why the government is endangering already endangered species with its decisions. This is not to forget the whole question of ergonomics which must ensure that all members of the Canadian Forces are equally comfortable with the new acquisition. Which surely means consultations with the LGBTQ2 community or else face the question of why the DND is ignoring this important demographic. No matter how the Armed Forces formulate their Statement of Requirements it will be reviewed and possibly challenged by the Independent Review Panel on Defence Acquisition to insure a countervailing weight to the opinions of the DND and CAF. Of course this panel may be superseded by the recently appointed Ad Hoc Cabinet Committee on Defence Procurement. Cost is always going to be a consideration and how that cost is expressed is at least as important as how much money is actually spent. The DND is quoting a budget of 50 million dollars (less cost for P.I.S.T.O.L.S. of course) although as they say they have not actually “defined the general concept of employment” or had discussions with industry it is not clear how this figure was arrived at. This fact alone gives plenty of scope for the parliamentary inquiry into the whole matter which will inevitably occur. At some point the whole cost issue will no doubt be turned over to the Office of the Parliamentary Budget Officer who will find that the figures provided by the DND relate only to the acquisition cost and not, as it properly should, to the total cost of purchasing, maintaining, providing ammunition and training for a period of at least forty years. Not to mention the added costs of disposal. This new figure will be at least ten times more than the initial estimate and will be widely quoted and discussed but there will be no reason for anyone in the process, least of all the media, to ever explain that these figures are for two entirely different things. Part of the acquisition process can also involve direct intervention by the Minister of Defence or for that matter any senior cabinet member. At any time in the process it is perfectly reasonable to expect that having met some constituent over lunch who says that they can provide a Canadian made product, from the ministers riding, for “half the price” that the minister will insist on restarting the whole procedure with a new emphasis on those elements of the proposal which will lead to the ministers acquaintance getting the contract. Of course by the time the SOR has been restated, the inevitable lawsuits from the other competitors have been settled and the competition re-run the new entrant will have gone out of business, but that is a small price to pay for ensuring that our troops get only the best and that high quality Canadian jobs are protected. Once Industrial and Regional Benefits (IRB) as well as international trade regulations (ITAR) have been factored in it will be up to the Armed Forces to conclude that the best option is to contract for a uniquely Canadian weapon, one under development and not currently in the service of any other nation, to be built by a company with no experience of firearms. Even though when this approach has been used in the past it has invariably lead to a final result that combines decreased capability with late delivery at higher than anticipated costs there is no reason that anyone in the system can possibly be blamed for not foreseeing this outcome. This inability to blame any participant in the process for the outcome is a result of the fact that no one is really responsible for the outcome. It is important to remember that at no time in the course of acquiring a new handgun for the Canadian Armed Force would it be appropriate for anyone in the process, not the politicians or the bureaucrats or the Media or even the DND to ever ask what combat value is being added, or subtracted, from the Canadian Armed Forces by the either the process, the amount of time it takes or the outcome of the procurement. Questions of whether our Forces are more or less able to be successful in their ultimate mission of armed conflict simply do not matter when put in context with far more significant issues such as relative political advantage and public perception of the procedure itself. History, as has been noted, affects us all and history is a river that runs from the past to the future. Given the example of a sixty year time line on the Sea King replacement there is no reason not to believe that Canadians as yet unborn can hope to contribute to the ongoing saga of replacing the 75 year old sidearms that our forces currently use. In fact there is every reason to believe that entire lifetimes will be spent in search of the perfect P.I.S.T.O.L.S. replacement. This is the Canadian way of military procurement.